Research Interests: I am broadly interested in the underlying ecological mechanisms that shape the macroevolution of marine fishes. My previous research has focused on morphological convergence and constraint in planktivorous fish. More recently, my work combines aspects from biomechanics, functional morphology, phylogenetics, and comparative methods to lend insight into the selective pressures driving morphological diversification. Friedman, S.T., Price, S.A., Hoey, A.S., and Wainwright, P.C. (2016). Ecomorphological convergence in planktivorous surgeonfishes. Journal of Evolutionary Biology. doi: 10.1111/jeb.12837. Price, S.A., Friedman, S.T., and Wainwright, P.C. (2015). How predation shaped fish: the impact of fin spines on body form evolution across teleosts. Proceedings of the Royal Society of London B: Biological Sciences. 282:20151428. 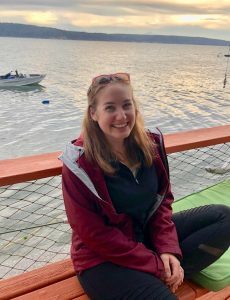 For more information about Sarah’s research, visit her website or contact her at sarahtfried@gmail.com. Research Interests: I’m interested in using phylogenetic comparative methods and biomechanics to explore the morphological diversity of fishes. My previous research at Friday Harbor Labs was on shark tooth cutting ability and burial mechanics in flatfishes. My current research focuses on the role of transitions to biting in the functional and morphological diversity of coral reef fishes. I’m also interested in the role of functional integration and modularity in driving and constraining evolution of morphology. For more information about Katherine’s research, visit her website or contact her at kacorn@ucdavis.edu. Research Interests: I am interested in exploring the evolution of biomechanical processes in fish systems. More specifically, I am interested in using morphological data, ecomorphology, phylogenetics, and comparative methods to understand the diversification and potential constraints placed on functional mechanisms in closely related species. My previous research focused on the role of evolutionary integration in the diversification of the lower jaw adduction system in sculpins and related species. As a member of the Wainwright lab, I hope to expand my skills to understand more about morphological variation and movement across fish lineages. Roberts, A.S., Farina, S.C., Goforth, R.R., and Gidmark, N.J., 2018. Evolution of skeletal and muscular morphology within the functionally integrated lower jaw adduction system of sculpins and relatives (Cottoidei). Zoology, 129, pp.59-65. 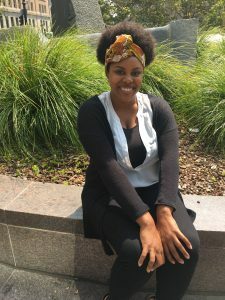 For more information about Alexus’ research, contact her at asroberts@ucdavis.edu. 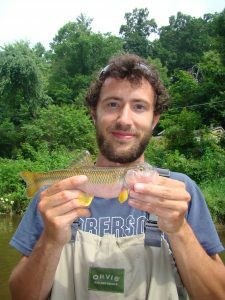 Research Interests: My research concerns the diversity of fish forms and its implication for lifestyle variation. I am interested in understanding evolutionary processes involved in morphological diversification and the extent to which shape impacts function and performance. 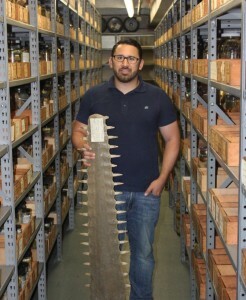 To this end, I have worked with a number of systems, from sexual dimorphism in skate pectoral fins to covariation of body and jaw shapes in cichlids. At UC Davis, I am using geometric morphometrics to study cranial kinesis in cichlid fishes as a novel way to understand their trophic evolution and niche segmentation. Martinez CM, McGee MD, Borstein SR, & Wainwright PC., 2018. Feeding ecology underlies the evolution of cichlid jaw mobility. Evolution, 72(8), 1645-1655. Martinez CM & Sparks JS., 2017. Malagasy cichlids differentially limit impacts of body shape evolution on oral jaw functional morphology. Evolution. 71(9), 2219-2229. Martinez CM & Stiassny MLJ., 2017. Can and eel be a flatfish? Observations on enigmatic asymmetrical heterenchelyid eels from the Guinea Coast of West Africa. Journal of Fish Biology. 91, 673-678. Martinez CM, Rohlf FJ, & Frisk MG., 2016. Re-evaluation of the morphological diversity of batoid pectoral fins: consequences for locomotion and lifestyle. Journal of Morphology. 277(4), 482-493. Martinez CM, Rohlf FJ, & Frisk MG., 2016. Sexual dimorphism in sister species of Leucoraja skate and its relationship to reproductive strategy and life history. Evolution & Development. 18(2), 105-115. For more information about Chris’s research, visit his website or contact him at cmimartinez@ucdavis.edu. Research Interests: I’m an evolutionary biologist with interests in genetics, field biology, and organismal biology. My research is focused around understanding the evolutionary processes that generate and maintain genetic and phenotypic diversity in natural populations, and across evolutionary timescales using phylogenetic and population genetic approaches. 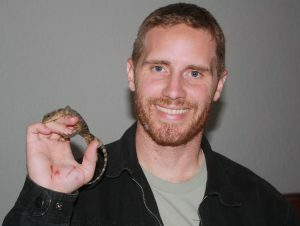 I primarily work on lizards, and my current research is focused on investigating patterns of hybridization in whiptail lizards in Mexico. I am also interested in how well phylogenetic models fit empirical genomic datasets and identifying the ways in which we can improve models to make the inferences we draw under them more reliable. As a member of the Wainwright lab, I’m looking forward to learning a bit more about fish and developing my comparative methods skills. For more information about Anthony’s research, visit his website or contact him at ajbarley@ucdavis.edu. Research interests: I am interested in evolutionary ecology, particularly topics such as adaptive radiation, ecological opportunity, adaptive landscapes, morphological diversification and innovations. I mostly study cichlid fishes and their morphological and ecological diversity and test hypotheses about their adaptive radiation using geometric morphometrics within a comparative phylogenetic framework. Currently, I am primarily interested in patterns and rates of body shape and pharyngeal jaw shape evolution across clades and through time. Burress, E.D., L. Piálek, J.R. Casciotta, A. Almirón, M. Tan, J.W. Armbruster, & O. Říčan, 2017. Lake- and island-like adaptive radiations replicated in rivers. Proceedings of the Royal Society B, 20171762. Burress, E.D., F. Alda, A. Duarte, M. Loureiro, J.W. Armbruster, & P. Chakrabarty, 2017. Phylogenomics of pike cichlids (Cichlidae: Crenicichla): the rapid ecological speciation of an incipient species flock. Journal of Evolutionary Biology, 31, 14-30. Burress, E.D. & M. Tan, 2017. Ecological opportunity alters the timing and shape of adaptive radiation. Evolution, 71, 2650-2660. Burress, E.D. 2016. Ecological diversification associated with the pharyngeal jaw diversity of Neotropical cichlid fishes. Journal of Animal Ecology, 85, 302-313. For more information about Ed’s research, visit his website or contact him at edwarddburress@gmail.com. 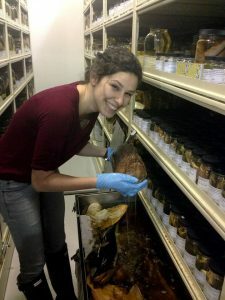 Research interests: I am interested in exploring the sensory capabilities of leptocephalus larvae in order to determine how these organisms find food in the wild compared to other teleost larval fishes. My previous work combined field sampling practices with histological and microscopy techniques in order to better understand the olfactory system of these organisms and help further aquaculture and conservation efforts. For more information about Molly’s research, contact her at mawightman@ucdavis.edu.